Practice writing some perfect ps and then color in the pig and the pen. 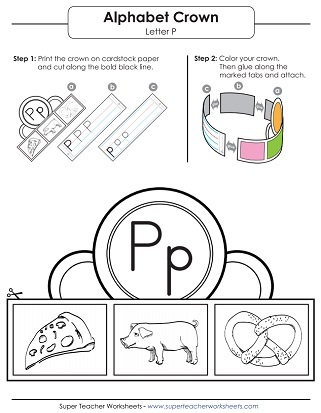 This pretty hat has pictures of a pig, pretzel, and pizza to color in. Practice writing P p on the lines and then assemble to wear it. Practice making perfect ps by tracing along the dotted lines on this worksheet. 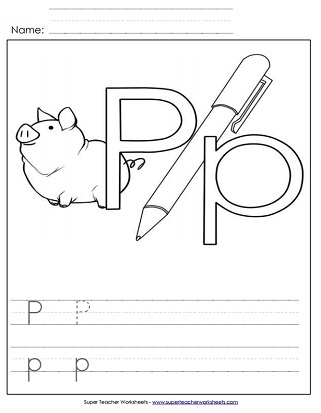 Print this worksheet to allow students to practice writing lower-case p.
Learn to write capital letter P by tracing along the dotted lines on this printable worksheet. Trace the gray lines with a pencil to learn to write capital letter P.
Time to review the letter P p. Draw upper and lower-case letter p.
Students can use a bingo dauber to mark the circles in the shape of letter P.